Yesterday, July 6th, Amazon.com announced the "Best Books of the Year...So Far" lists. The books are hand-picked by Amazon.com Books editors and represent their favorite titles in five categories: Fiction, Nonfiction, Young Readers, and Hidden Gems and an overall Top Ten. I checked out the Young Readers category. 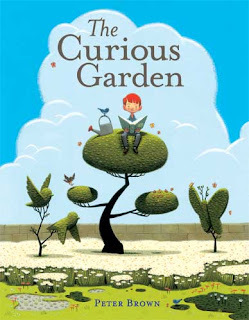 Surprise, surprise --- The Curious Garden by Peter Brown is first on the list. Most of the books I review on this blog are pitched to me by publishing companies or authors and illustrators. However, I specifically requested the chance to review The Curious Garden partly because I liked the name of the book (wonder why?) and partly because I thought it looked like a perfect spring read for my children. I had no idea that the book would be so visually stunning and artsy in a vintage sort of way. The message of the book is a wonderful one as well. A number of my blog readers left the titles of their favorite children's garden books in the comment section of The Curious Garden post on Brimful Curiosities. I've been meaning to compile the list. Now seems like a good time. Thanks for the many good book suggestions, both picture and chapter books. Thanks to Consumer Marketing Practice, Waggener Edstrom Worldwide for keeping me up-to-date with the latest Amazon.com news. View my disclosure policy. That looks like a great book. I've never heard of it before. Somehow I missed your earlier post, and therefore MY favorite garden book isn't on the list! Well, actually I have several. I have more, but those are my favorites!